This preview of the Lake Havasu-based film about prehistoric piranha turned loose on spring breakers, was supposed to be previewed at Comic-Con in San Diego, but it was considered too gory. I understand why. Be warned - this really is bloody and graphic. 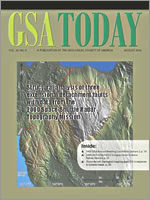 And that's just in 2-D.
AZGS Senior Geologist Jon Spencer published the cover article in the August issue of GSA Today, on metapmorphic core complexes and detachment faults in Indonesia, interpreted from Shuttle radar. In 1977 Tucson was host to a Geological Society of America Penrose conference on “metamorphic core complexes”. This was a new name to the tectonics community, and a new feature that was not well understood at the time. These tectonic features are characterized by gently to moderately dipping shear zones that formed at sufficient temperature for quartz to shear plastically. The resulting sheared rocks, known as “mylonites”, are on display in the Santa Catalina Mountains north of Tucson and South Mountains south of Phoenix. It is now known that they were produced when the sheared rocks were uplifted from great depth in the Earth (~10-15 km) due to displacement below moderately to gently dipping normal faults known as “detachment” faults. AZGS geologist Jon Spencer began working at the Arizona Bureau of Geology and Mineral Technology (now the Arizona Geological Survey) in 1982, and with co-worker Steve Reynolds did an extensive study of the Buckskin-Harcuvar core complex in western Arizona. This led to production of Arizona Geological Survey Bulletin 198, published in 1989, and described in detail what turned out to be the largest terrestrial core complex on Earth. First identified in western North America, core complexes are now known in many parts of the world, including Spain, Switzerland, Norway, Greece, Turkey, Iran, Tibet, northern China, Mongolia, Thailand, Vietnam, New Guinea, and New Zealand. Furthermore, large numbers of them have been identified on the sea floor associated with sea-floor spreading at moderate rates, and a feature that may be the largest core complex in the solar system has been identified on Venus due to its distinctive grooved form. In 2000 the space shuttle Endeavour surveyed much of the Earth with synthetic-aperture radar, yielding a detailed digital elevation model of most land on Earth. The resulting data have been placed on-line by Columbia University, with tools to display and study Earth’s topography (www.GeoMapApp.org). Spencer studied this data set (for fun he says, and at home during weekends) and identified two previously unidentified core complexes on the island of Sulawesi in Indonesia. One of these was described in an article in recently published AGS Digest 22 . The other, and two previously identified core complexes in Tibet and New Guinea, are described and analyzed in the August issue of GSA Today. How do we use 99 quadrillion Btu's of energy? The US consumed over 99 Quads of energy in 2008. Where did it go? Over 57 Quads were unused, leaving less than half of the total to be useful energy. 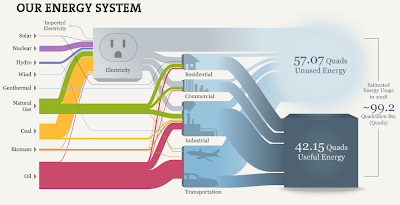 The National Academies have posted an interactive diagram of energy systems as part of a feature on What You Need to Know about Energy. The flow diagram is based on work done at Lawrence Livermore National Lab. Hydro, wind, and solar electricity inputs are expressed using fossil-fuel plants’ heat rate to more easily account for differences between the conversion efficiency of renewables and the fuel utilization for combustion- and nuclear-driven systems. This enables hydro, wind, and solar to be counted on a similar basis as coal, natural gas, and oil. For this reason, the sum of the inputs for electricity differs slightly from the displayed total electricity output. Distributed electricity represents only retail electricity sales and does not include self-generation. The efficiency of electricity production is calculated as the total retail electricity delivered divided by the primary energy input into electricity generation. End use efficiency is estimated as 80% for residential, commercial, and industrial sectors, and as 25% for the transportation sector. Totals may not equal the sum of components due to independent rounding. Presentations like this are crucial to rational discussions of energy policy in this country. There is widespread misunderstanding of where our energy comes from, with large parts of the public believing that renewable energy supplies vastly greater amounts of energy than it does and with little recognition of how most of our electricity is generated. And think about the impacts of not producing the 57 Quads of energy that were not useful - on the economy, on business, the environment, on our checkbooks. thanks to Sheril Kirstenbaum who blogs at Discovery Magazine's The Intersection, for spotting this. Barbara Murphy, Senior Geologist with Clear Creek Associates in Scottsdale, has been voted in as President-Elect of the American Institute of Professional Geologists (AIPG). She assumes that office in 2011. Barb is one of the most upbeat and energetic people I know. 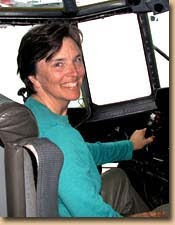 She is tireless in supporting the local, state, and national geologic communities. Congrats Barb! EduMine has released its fall schedule of webcast videos that offer credit towards a Certificate in Mining Studies offered by the University of British Columbias and the University of Arizona (see UAz Master of Engineering and Professional Certificates). NASA is inviting the public to help decide where in Arizona astronauts should drive the "Space Exploration Vehicle" (SEV) in September 2010 to explore and do geology field work as part of simulating a lunar mission. NASA has taken two GigaPan panoramic images of the Desert RATS test site. You can look at these images and vote to help NASA decide which location to visit. The location that receives the most votes will be incorporated into the mission plan and the crew will go there in the SEV to perform field geology and collect rock samples. How to vote. The Desert Research and Technology Studies (D-RATS) is a NASA-led team of engineers, researchers, and scientists working together to prepare for future human and robotic exploration. The D-RATS 2010 mission involves field testing two "Space Exploration Vehicles" (SEV), which allow astronauts to spend two weeks (or more) living, working, and traveling across different planets. During D-RATS 2010, astronauts will use two SEV's to explore a lava flow and test science data collection, communications protocols, mission operations, and advanced technology. AZGS is releasing a new web service as an interactive map showing core holes permitted and drilled in the Holbrook basin of Arizona for potash exploration. 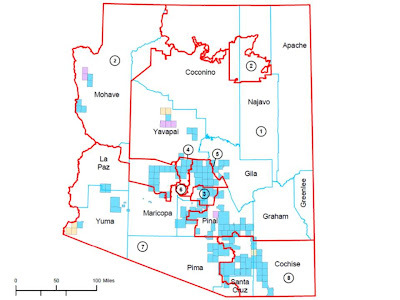 The map shows potash isopach (thickness) contours, land ownership, and permitted wells with links to the permits on the Arizona Oil and Gas Conservation Commission web site. An AAAS policy alert reports that "Coal state Senators Rockefeller (D-WV) and Voinovich (R-OH) have introduced the Carbon Capture and Storage Deployment Act of 2010 (S. 3589), which would invest $20 billion over the next ten years to develop carbon capture and storage (CCS) technology. The bill would support large-scale CCS pilot projects and establish a regulatory framework to monitor and govern long-term geological storage of carbon. The bill may be included in the Senate's climate and energy package." AZGS is participating in three projects to assess and characterize the potential for geologic sequestration of CO2 in Arizona. 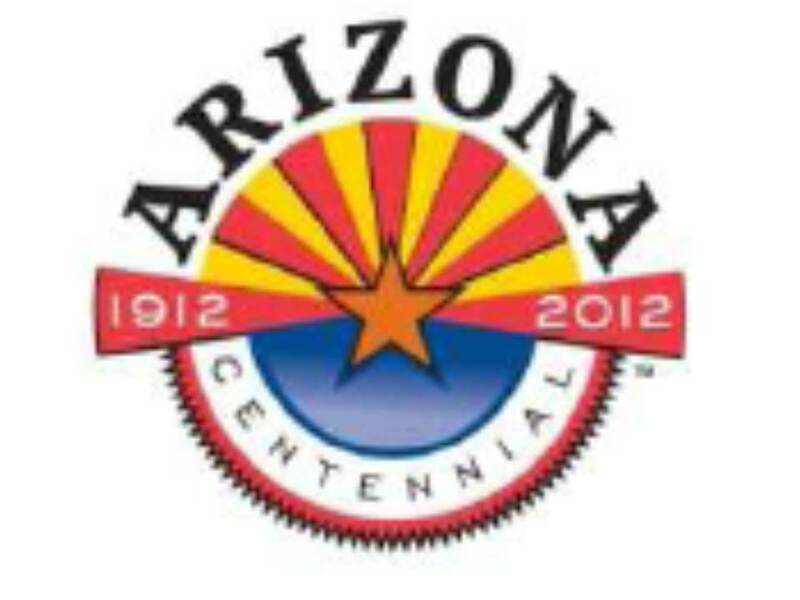 The Arizona Centennial Commission is holding its Southern Arizona Centennial Summit, Tuesday, August 10 in Tucson. In attendance will be Southern Arizona’s Congressional Delegation, Tribal Councils, State Officials & Legislators, County Board of Supervisors, Mayors and Councils, Business and Community Leaders. The Centennial Summit offers a great opportunity to hear first-hand about Arizona’s Centennial signature projects, signature events and official sanctioned events being planned by the Arizona Centennial Commission, in collaboration with the Arizona Historical Advisory Commission and its Centennial Legacy Projects. In addition to these great projects, the commission will provide information about statewide communities that are already making plans and how southern Arizona communities and organizations can participate in this once in a lifetime opportunity to reflect on Arizona’s past, present and future. The presenters for the event will be Secretary of State Ken Bennett, Tucson Mayor Robert Walkup, and Arizona Centennial Commission Director Karen Churchard. If you are interested in attending the Southern Arizona Centennial Summit, RSVP to cronan@arizona100.org or call 602-364-3697 by *August 3*. The AASG Geothermal Data Project's Science Advisory Board met in Tucson last Tuesday and Wednesday to review work plans for 33 of the states represented in populating the National Geothermal Data System. AZGS is managing the project for AASG. The SAB is making recommendations to project managers on data priorities, quality assurance, and efforts to avoid duplication. ASU researcher Steven W. Ruff, is co-author of a new report published in Science, that concludes Mars had a warmer, wetter climate during its first billion years resulting from a denser CO2-rich atmosphere. "Such an atmosphere should have led to the formation of outcrops rich in carbonate minerals, for which evidence has been sparse. Using the Mars Exploration Rover Spirit, we have now identified outcrops rich in magnesium-iron carbonate (16 to 34 weight percent) in the Columbia Hills of Gusev crater. 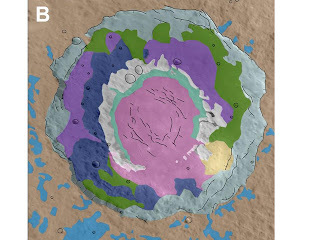 Its composition approximates the average composition of the carbonate globules in martian meteorite ALH 84001. 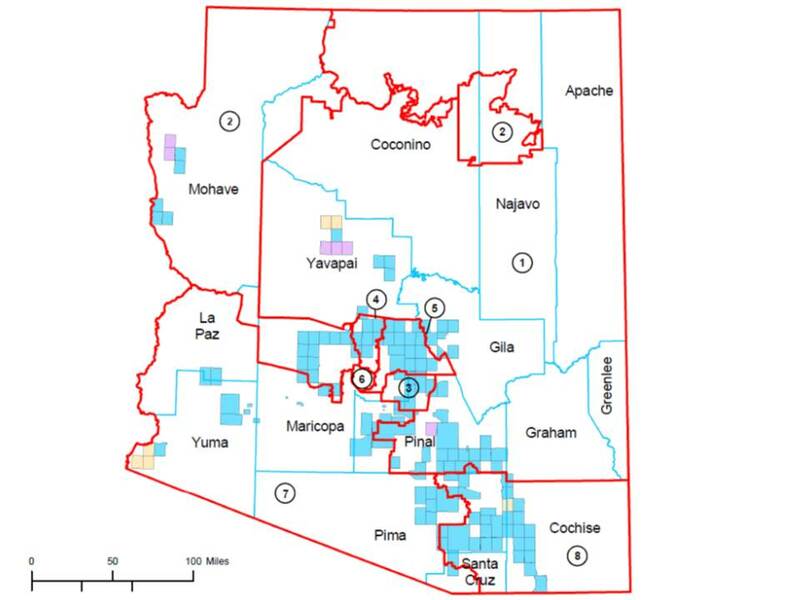 The Gusev carbonate probably precipitated from carbonate-bearing solutions under hydrothermal conditions at near-neutral pH in association with volcanic activity..."
Exploration is picking up on Arizona's potash resources in the Holbrook basin, so what's the market like for this key component of fertilizers? Goldman's put out price expectations that are reported at Potash Investing News: "In 2010, they have potash sitting at $369, in 2011 $364, and in 2012 $365. In the short term, potash prices should recover from an average of $358 per tonne for the July-to-September period, the lowest since the first quarter of 2008, to $362 per tonne." This is way above average prices of $50 per tonne just a few years ago, but way down from peaks of $600+, that reached nearly $1,000 on the spot market briefly. No new potash mines have been developed anywhere in the world in the past 3 decades but Goldman noted that two significant projects are underway in Canada and Saudi Arabia, that could impact global supply and prices. In other words, business as usual in the mining business. What's the take on the Asarco - Southern Copper merger? Grupo Mexico proposed combining their Southern Copper and Asarco subsidiaries into a one publicly traded unit. I've read a number of market analysts comments. One described the benefits of putting Grupo's mining assets into a company that can be valued separately from the company's railroad and oil-drilling operations. Asarco is Tucson based. Southern Copper is Phoenix based with copper mining operations in Peru and Mexico. 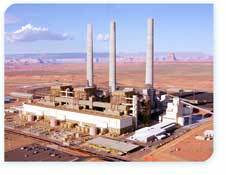 The Arizona Star lists Asarco's southern Arizona employment at 2,200. 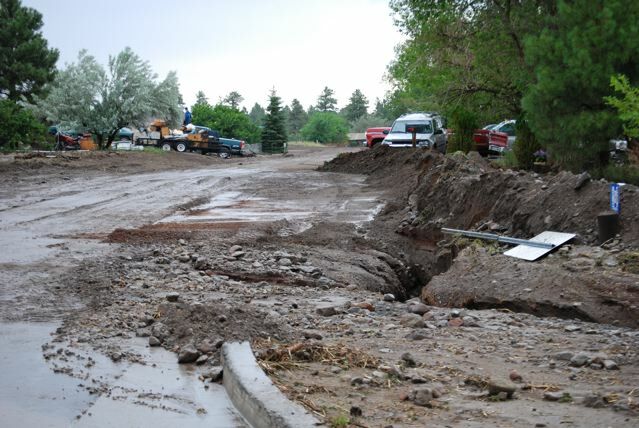 We hear from Flagstaff Water that the flood and possible debris flows earlier this week took out two sections, 40 ft, of the pipe along Waterline Road that supplies 20% of Flagstaff's summer water. Continued rains and damage to the road have prevented crews from getting to the line from the bottom of the hill. AZGS geologists Ann Youberg and Jeri Young are working with federal and local officials to evaluate the possible role of debris flows in the events and evaluate the hazards on the recently burned hillsides above the community. Most of the news media coverage has been on flooding in the Timberline [corrected 7-24-10, 17:44] and Doney Park subdivisions. Here are a couple photos Jeri took on July 22. 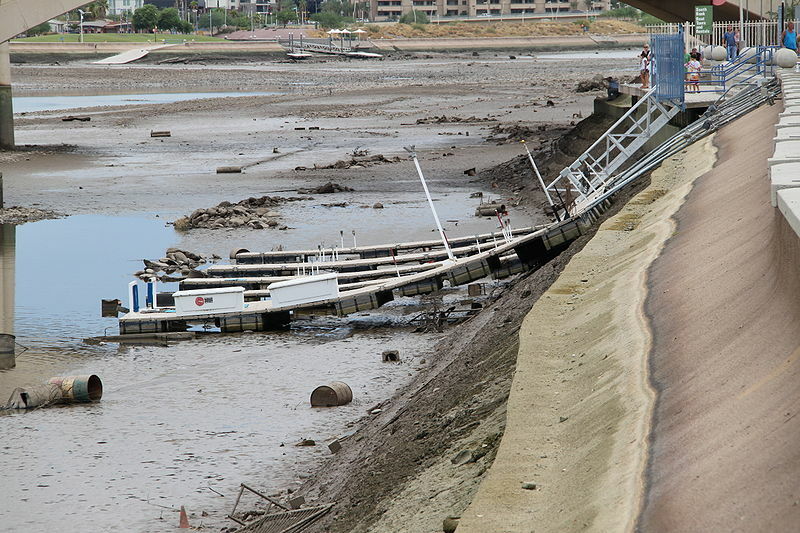 Tempe officials released terrible quality surveillance video of Tuesday night's dam failure at Tempe Town Lake. There is a bright flash, that reportedly is the bursting of the rubber structure. But I'm hard pressed to confirm that. However, after that section, there is a Wednesday flyover, showing the mostly dry riverbed. Thanks to the Phoenix New Times for posting the video. Following on Freeport McMoRan Copper & Gold's 2nd quarter financial report this week, the Arizona Republic reports that the company could see a 50% increase in copper production at its properties in the next 5 -10 years. Reporter Ryan Randazzo writes that "Phoenix-based Freeport has hired 431 people for a total of 5,386 working at its five mines in Arizona in the past year as it expands its Morenci mine [right, my photo, May 2008] and restarts its Miami project." Two short videos of the flood waters over Mooney Falls and coming through the campground at the bottom of the canyon. Video and photos of Monday's flash flood on Havasu Creek in the Havasupai Reservation are appearing online. Phoenix tv station KPHO posted 10 photos including famed Havasu Falls. The USGS has released an upated "Divisions of Geologic Time" produced by the USGS Geologic Names Committee and the Association of American State Geologists (AASG), which represents an update containing the unit names and boundary age estimates ratified by the International Commission on Stratigraphy (ICS). The fact sheet states that scientists should note that other published time scales may be used, provided that these are specified and referenced (for example, Palmer, 1983; Harland and others, 1990; Haq and Eysinga, 1998; Gradstein and others, 2004; Ogg and others, 2008). This fact sheet is a modification of USGS Fact Sheet 2007–3015 by the U.S. Geological Survey Geologic Names Committee. A flash flood on Havasu Creek on Monday afternoon forced evacuation of 160 people mostly tourists, and damaged trails, the campground, and Havasu Falls. AZGS geologist Brian Gootee is in contact with Tribal officials. He reports the trail above the village to the campground was washed out in several places. Mule traffic is not passable. Havasu Falls pool and the campground sustained significant damage – the pool is filled with sand and rock and the main creek in the campground shifted and washed out many tables and bank deposits. AZGS has been working closely with the Tribe since severe flooding in August 2008, on mitigation and restoration projects. Brian is heading to Supai Village on Friday to help with assessment of the damage from this new flooding. The canyon is only accessible by mule or hiking along a 9-mile trail, by helicopter, or by hiking up from the Colorado River in the Grand Canyon. A new study "performed by consulting firm Tetra Tech for the Natural Resources Defense Council (NRDC), examined the effects of global warming on water supply and demand in the contiguous United States. The study found that more than 1,100 counties -- one-third of all counties in the lower 48 -- will face higher risks of water shortages by mid-century as the result of global warming. More than 400 of these counties will face extremely high risks of water shortages." The results for Arizona are shown at right. The data aren't much different from previous studies but the level of detail is greater. 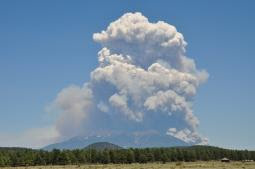 Rain fall of 1.75" in an hour triggered possible debris flows on the slopes burned by the Schultz fire in Flagstaff [right, credit, US Forest Service] and flash floods in the flood plain that swept away a young girl yesterday. The latest report is that 80 homes were flooded with water, mud, or ash. 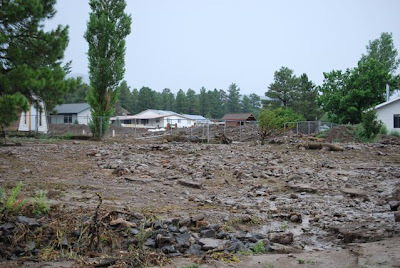 AZGS geologist Dr. Jeri Young is in Flagstaff assessing the situation, including whether the water pipeline along Waterline Road was breached by debris flows on the steep slopes that had burned recently. The line supplies 20% of Flagstaff's summer water. We heard that 1.5 million gallons was lost from the line before it could be shut off. 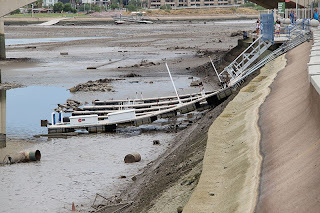 One of the rubber bumpers that form the western dam that creates Tempe Town Lake along the Salt River, burst with a pop around 10 pm last night, draining about 3/4 of the lakes billion gallons. The Phoenix New Times captured photos of the water draining out. 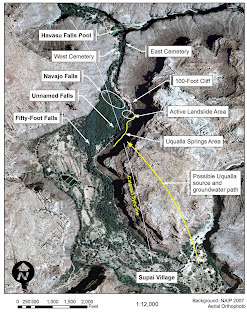 The disappearance of 3 men last week who were searching for the fabled Lost Dutchman gold mine is unfortunately yet another apparent tragedy in this ongoing saga. By some accounts, more than 100 have died trekking through Arizona's Superstition Mountains in vain. There is an entire industry dedicated to chasing down the legend of Jacob Waltz's lost gold mine: guidebooks, newsletters, on line chat sites, web sites, maps, a museum and a state park [right], etc feed an insatiable desire for secret riches. 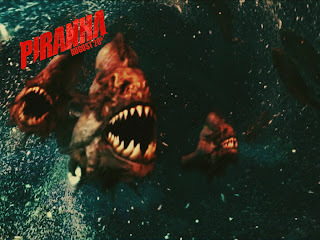 The official web site for the Arizona-located horror film "Piranha 3-D" went live a few days, about the same time that the San Diego Comic-Con told the film's director that the scene he planned to preview was too violent for the event, according to a story in the New York Times. The film is about prehistoric piranha being released from caves under Lake Havasu ("Lake Victoria" in the movie) due to an earthquake. It will be released in theaters on August 20. If there's anything America needs now, it's more geology-themed horror films! Our correspondents report that ADOT has been busy unloading upper parts of the landslide that damaged State Route 87 during Easter weekend in 2008. Unusually heavy rains in the area this winter are resulting in more movement on the slide, which is prompting ADOT to excavate soil from the upper areas of the slide complex. In fact, we hear that the local paper, the Payson Roundup, is no longer reporting on activities there because they've become so routine. 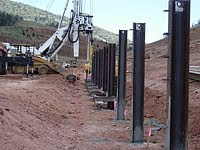 The steel beams buried in 2008 [right, credit ADOT] to brace the slide along the road are slowly being bent towards the highway. A geotechnical engineer told me that if and when they reach a critical angle, ADOT will have to take significant action to protect the highway. We've heard informal estimates that the slide repair and mitigation efforts cost $18 million in 2008 alone. The additional costs since then, must be making this one of the more expensive landslides in the state's history. Meanwhile Mesa Uranium announced that "it has signed a non-binding letter of intent with Passport Potash ("PPI") on the Holbrook Potash project. The project consists of Arizona State Land Department exploration leases covering 1,950 acres and is 100% wholly-owned by Mesa." Mesa Uranium says it "explores and develops lithium, uranium and potash properties in the western United States. Mesa's Green Energy Lithium Project in Utah contains lithium values as high as 1,700 ppm, 8% potash, 19% magnesium chloride, 0.6% bromine and 0.12% boron. - ." Update (7-18-10): the permits are posted on the AZOGCC website. 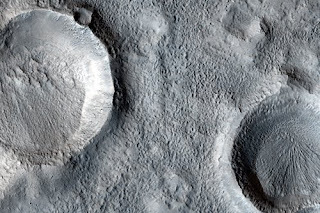 ASU professor Brett Denevi and UA professor Bob Strom are co-authors on a new study that found geologically young volcanic deposits in the Rachmaninoff peak ring basin (right) on Mercury. The results are from the 3rd flyby of the planet by the Messenger spacecraft. Previously the prevailing view was that Mercury has been geologically quiet since shortly after its formation. Now, the evidence indicates volcanic activity within the last billion years. Geologist and author Sarah Andrews is working on her next geology murder mystery, with the venue set at the Grand Canyon. The book is expected to be published in late 2011. Sarah has published 11 volumes in the popular Em Hansen series. And as thanks for providing background on Utah geology and politics a decade ago for one of her books, I was the thinly veiled victim who got bumped off in Fault Line. 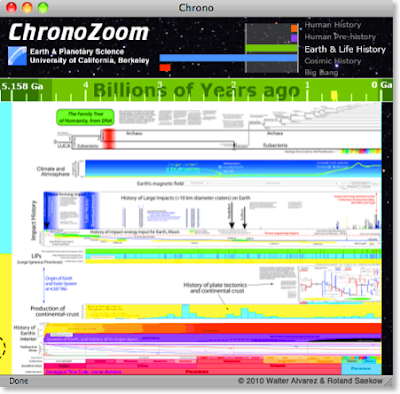 Berkeley geologist Walter Alvarez unveiled a new visualization tool to examine the chronology of almost any subject - ChronoZoom. Walter presented a geologic application at the Microsoft Research Faculty Summit this afternoon. The idea grew out of his course on "Big History: Cosmos, Earth, Life, Humanity" and was put into practice by his former student, Roland Saekow. 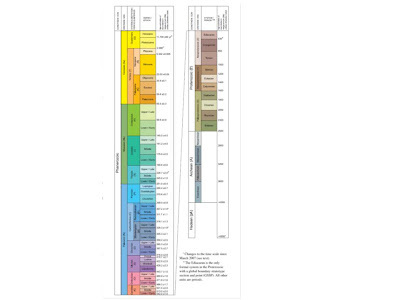 Walter, like many of us, has had trouble showing non-geologists the geologic time scale. He laments that log-scale displays are misleading to students. So, the new presentations allows users to zoom in and see the true scale of time over cosmic and geologic time periods. One facet that drew spontaneous applause was inclusion of the full copy of a scientific paper included as a micro-image at the end of the particular reference. There are 350 of us in Redmond at the 11th annual Microsoft Research Faculty Summit from 27 countries, representing a broad range of technical fields. The summit brings together "thought leaders from academia, government, and Microsoft to reflect on how current computing disciplines open new opportunities for research and development. Faculty Summit 2010 investigates compelling research topics such as Architectures of the Future, Natural User Interaction, Future Web / Web 4.0, and Accelerating Science." For about 300 of us, it's the first time we've attended. The last two days have been stimulating and eye-opening. AZGS is gearing up to run one of the largest data integration efforts in the nation with our work on the National Geothermal Data System. Many of the issues we have to deal with are being addressed by software engineers, computer scientists, GIS experts, systems analysts, and others. In addition, there are other national scale data integration efforts under, especially for environmental and biological data sets. There is a lot we can do to partner with these projects, leverage each others resources, and seem common protocols and procedures. On Wednesday, a small group of us is staying over for a day-long brainstorming session ("mind-swap") between environmental researchers and Microsoft technologists. As a result of this event, MSR expects to "initiate collaboration projects using Microsoft technologies to solve environmental research problems." The largest and clearest image of the night sky ever produced—a terapixel image, was announced this morning at the Microsoft Faculty Summit using the WorldWide Telescope and Bing Maps. 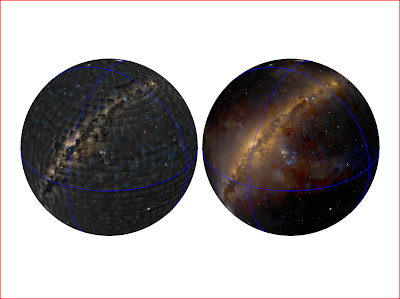 The Terapixel project by Microsoft Research stitched together nearly 1,800 sky images [left] into a seamless panorama [right]. The final product is spectacular. Microsoft just released WorldWideTelescope - Mars, the largest digital image mosaic of Mars ever created, using 13,000 HiRISE images. HiRISE is on the Mars Reconnaissance Orbiter and managed by University of Arizona. 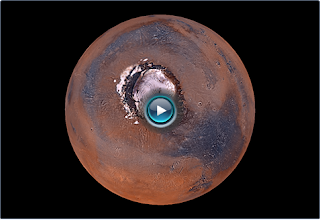 The images are in 3D, allowing amazing real time tours of Mars. Microsoft's VP for Research, Tony Hey announced the new product just minutes ago to the group of us at the Microsoft Faculty Summit in Redmond, WA. The project was done in collaboration with NASA and the volumes of data are staggering. Each image is roughly a Gb of data if I heard right. The images have been color adjusted to match best understanding of natural colors. 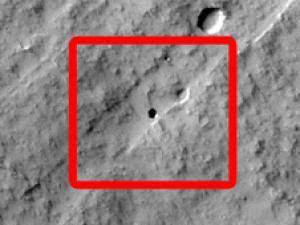 An article on ScienceDaily.com says the cave is on the slope of an equatorial volcano named Pavonis Mons. The 40th anniversary issue of Smithsonian magazine (August 2010) features asteroid-hunting astronomers Rik Hill and Ed Beshore of the UA's Mt Lemmon Observatory. The pair track near-Earth objects (NEOs) - asteroids and comets that come within 30 million miles of the Earth's orbit and have the potential to impact. They are members of the Catalina Sky Search, which Smithsonian says "has found about 2,500 NEOs in the past decade—including 577 in 2009." Undergraduates from Arizona State University and the University of Maryland (UMd) took first place in the 2010 Revolutionary Aerospace Systems Concepts Academic Linkage (RASC-AL) contest held last month in Cocoa Beach, Fla. Nikki Staab at ASU reports that "the ASU/UMd capstone project involved the design and testing of a mobile robot code-named RAVEN (Robotic Assist Vehicle for Extraterrestrial Navigation). This three-wheel, 330-pound (150-kg) rover can traverse 20 degree slopes and is able to travel at speeds up to 3 feet/second (1m/s). Add to that its ability to carry experiments, samples, and tools, and RAVEN would make an ideal robotic field assistant for astronaut-scientists." UA geoscience and atmospheric sciences professor Jonathan Overpeck will be a lead author of an Intergovernmental Panel on Climate Change chapter on terrestrial and inland water systems according to a release from UA. 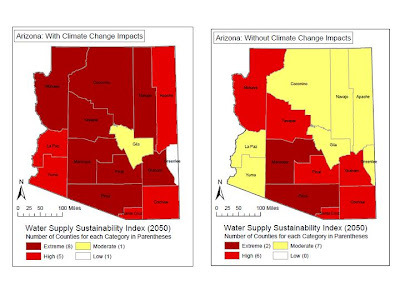 "Peck" also co-directs the Institute of the Environment, said, "The new IPCC assessment, and especially our chapter, will be of particular importance to Arizona and the Southwest because our home state and region is already seeing climate change impacts that are serious." 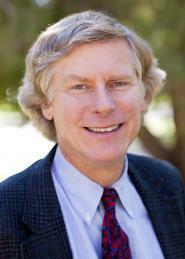 Peck was one of the coordinating lead authors of the 2007 IPCC Fourth Assessment Report that received the 2007 Nobel Peace Prize. 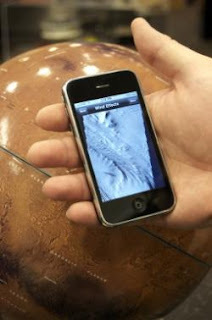 Daily images from an ASU camera on NASA's Mars Odyssey orbiter are now available as free downloads on iPhones. The iPhone app is available through the iTunes Web site. According to an announcement by ASU, "The camera providing the daily images of Mars is the Thermal Emission Imaging System, or THEMIS. It was designed by Philip Christensen, Regent's Professor of geological sciences in the School of Earth and Space Exploration, part of ASU's College of Liberal Arts and Sciences. 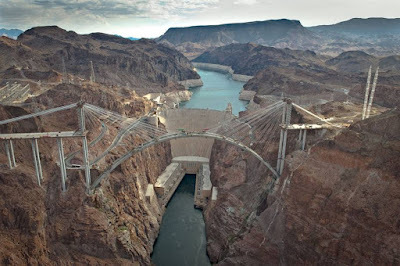 My colleague Steve Swanson forwarded recent photos of the Hoover Dam bypass bridge under construction across the Colorado River just below the dam. It will link highway 93 in Nevada and Arizona, bypassing the current bottleneck of driving across the dam itself. The notes with the photos say the span will be 1,000 ft long, and 900 ft above the river. 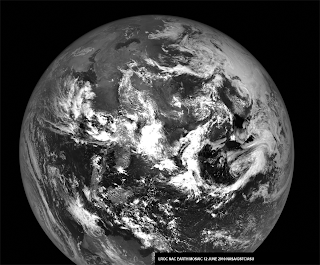 The Lunar Reconnaissance Orbiter Camera run by ASU, compiled this mosaic of the Earth when it was 372,335 km from the Moon. The center of this view of the Earth is a few hundred kilometers north of Hong Kong. [right, LROC mosaic of images snapped on 12 June 2010 during a calibration sequence. Credit, NASA/GSFC/Arizona State University]. The nation's Abandoned Mine Fund collects royalties from coal production to clean up abandoned coal mines, but there is not a comparable program to deal with hard rock mines that are more common in the western U.S. The AGI Government Affairs Program reports that the U.S. Senate Energy and Natural Resources committee "passed legislation (S. 2830) that would amend the Surface Mining Control and Reclamation Act of 1977 to broaden the uses of cleanup funds. It was unclear if the funds could legally be used for programs other than coal mine cleanup. 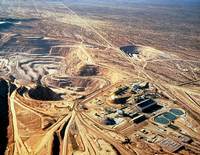 S. 2830, sponsored by Energy and Natural Resources Chair Jeff Bingaman (D-NM), amends the act to clearly allow states to use these funds for abandoned gold, copper and uranium mines." 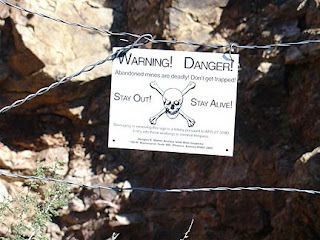 The Arizona State Mine Inspector's office estimates there are 100,000 abandoned mines in Arizona. AZGS geologist Brian Gootee describes the Marcus landslide in the McDowell Mountains east of Phoenix, in a segment of the Emergency Information Network (AzEIN) series of videos prepared by the Arizona Dept. of Emergency Management. Since 1994, AZGS has participated in the STATEMAP component of the National Cooperative Geologic Mapping Program run by the USGS. AZGS puts matching funds for competitive federal money to map 1:24,000 quadrangles and compile 1:100,000 geologic maps. Under the direction of Senior Geologist Jon Spencer, and guidance from the Arizona State Mapping Advisory Council, we have focused on maps in the Phoenix - Tucson corridor (blue quads in map at right). This year we are mapping in the Kingman, Prescott, and Yuma areas. 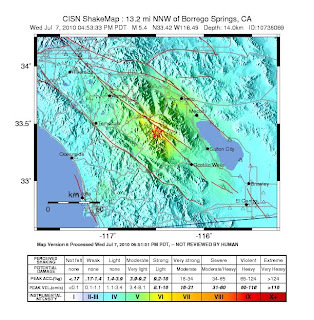 Residents of western Arizona report feeling weak to light ground shaking from a magnitude 5.4 earthquake that occurred along the San Jacinto fault in Southern California, just before 5 pm local time tonight. State geological surveys will be gathering new state-specific data to contribute to the DOE-supported National Geothermal Data System. The expectation is that the new data will lead to derived geothermal gradients, heat flow, thermal conductivity, radioactive heat production numbers, and other geothermal relevant data as necessary in areas where such data are inadequate or lacking. DOE will provide an additional $4.058 million of ARRA funding to the existing project for a new total of $21.94 million. In related news, all 50 states are now represented in the project with the addition of data resources from Maryland and Delaware last week. 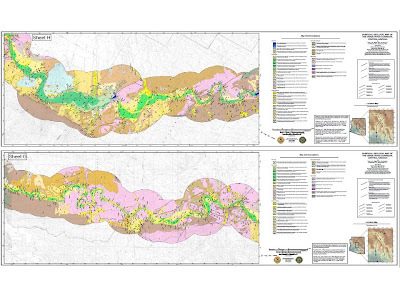 The Arizona Geological Survey (AZGS) is releasing five new geologic map sheets showing the extent and age relationships of Holocene channel and floodplain deposits along 178 miles of the Verde River of north-central Arizona. A 51-page report accompanies the maps. AZGS’s mapping team, headed by Joe Cook, constructed geologic strip maps of a two-mile wide swath centered on the river’s active channel and running the length of the river. Geologic mapping was overlain on USGS 7.5 minute, 1:24,000-scale topographic maps. The team used earlier mapping, aerial photography, and extensive field work – establishing GPS stations on approximately one-mile centers along the course of the river – to map modern and recently active channel and floodplain deposits, river terraces and adjacent tributary deposits, eroded older basin deposits, and bedrock. 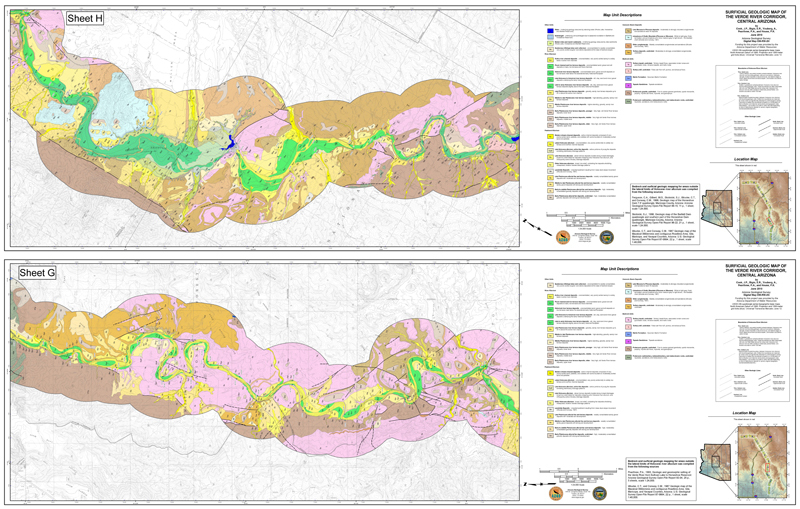 The geologic maps provide foundational geologic data for deciphering the recent history of the Verde River system. Young Verde River sediments – those deposited over the past 10,000-years -- are subdivided by age and broadly grouped into two classes: channel deposits that comprise mostly sand and gravel; and, overbank floodplain and terrace deposits that consist of sand, silt, and clay with minor gravel. The mapping was done in partnership with the Arizona Dept. of Water Resources. 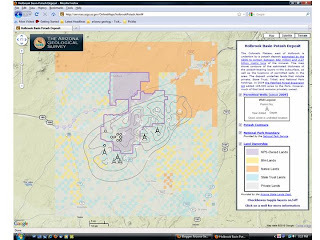 The geologic maps and technical report are available in PDF format at www.azgs.az.gov/publications_online.shtml.